You are currently browsing the tag archive for the ‘South Florida’ tag. Nothing says ‘staycation’ like a trip south to Miami. I think the last time I went to Vizcaya was … maybe in elementary school?! For the Renaissance Festival, I think. In other words, it’s been awhile. Who can resist a National Historic Landmark? 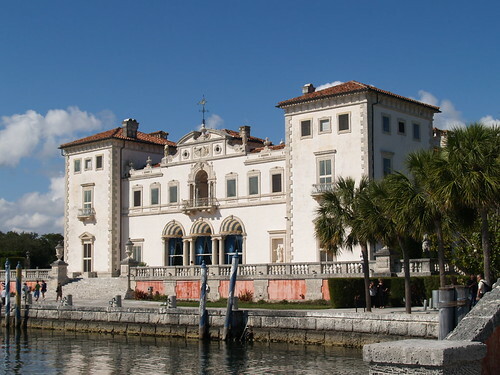 Especially one as beautiful as Vizcaya. The weather was perfect, a beautiful bridal photo shoot was happening, tourists were fluttering about and I even learned a thing or two. What more could I ask for on a day off of work!? Garden 2010 update: Well, I haven’t completely failed. My beans are doing well; the lettuce is growing; one of my tomato plants is thriving, though not really producing anything more than green leaves. 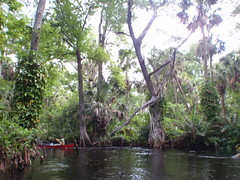 It’s always great for me to get out, canoe/kayak/whatev, in South Florida because it reminds me that it’s not all strip malls, chain restaurants and highrise condo buildings. 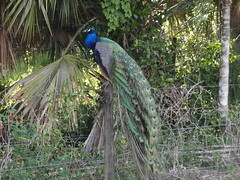 Florida is also wildlife – we saw turtles, our friend Jodie almost hit a gator with her paddle, ospreys – and great scenery. And, a river adventure is great for working on those relationship-building skills. To kill or not to kill, that is the question! Our mode of transportation (read: bad canoe that we shouldn’t have used, but did anyway) was challenging and we thought we were going to tip over every 60 seconds. It didn’t help that the river was bending left and right like Chubby Checker, plus the fact that we had a cooler full of beverages in tow. But we made it!